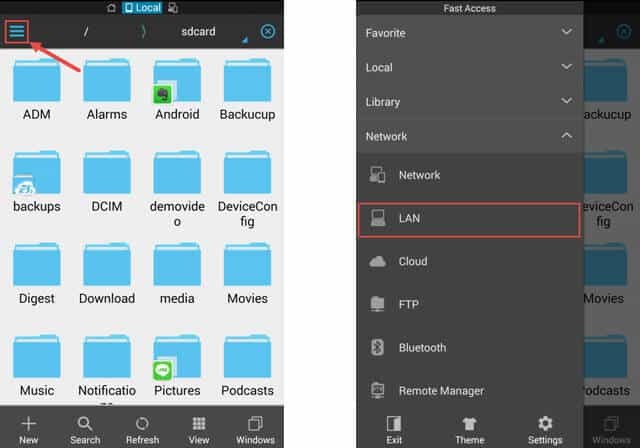 1) Install Es File Explorer to your android device. It is a free app, which is available in Google Play store. 2) Go to your PC and right-click on the folder that you are going to transfer and click on properties option. 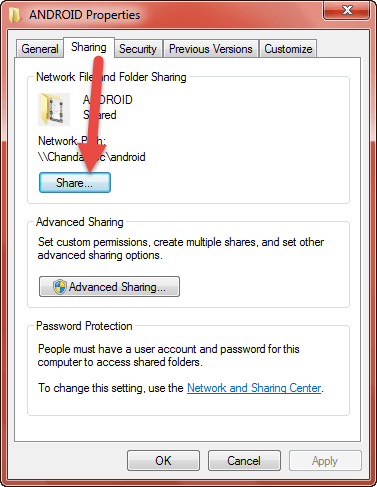 3) After this, the Properties box will appear and you have to click on Sharing option then click on the Share button. 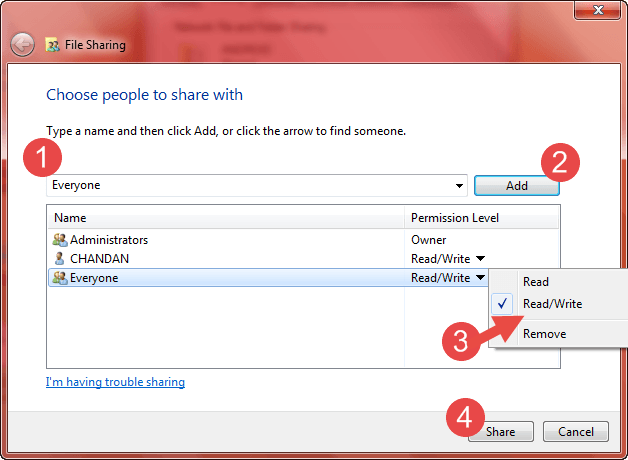 4) Now you need to enter list of user that you going to share the file. It is better to write “Everyone” and hit the Add button. 5) After this the Everyone user field is created you just need to click on the field and make it as Read/Write and hit Share then Done then Close. Now you did the steps on your PC. 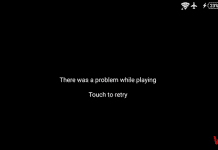 6) Now the steps are in your Android device. First, go to the Es File Explorer and click the icon on the top right corner. You will see the vertical option list. Hear you need to select the Network, it will expand, and then you need to select LAN option. 6) Now tap on the New button and fill the all information to transfer files from PC to android. The first field is Domain name. You need not enter any thing in this field because you are in your won PC. 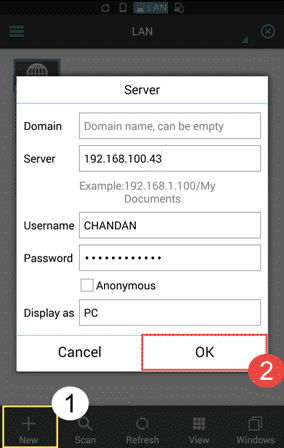 The second field is Server; you need to enter the IP address of your PC. 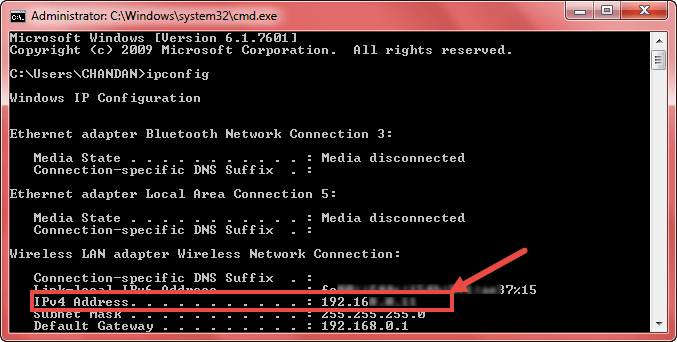 Simply IP address of your PC can know just using “ipconfig” command on command prompt. Here the IPV4 address is your PC’s IP address. Then enter your PC’s User name and password and optionally you can filed Display as field Example I field it as Desktop (It is optional). Then press ok.
7) Now you can see the desktop folders on your Android device click on it and it will appear the files that, you target to transfer files from PC to android. 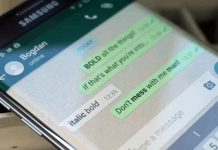 Copy and Paste any file on the folder to view in both devices. 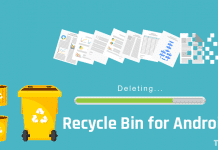 It is a simple method for transfer files from PC to android. By this method you can transfer files faster and wirelessly. It only needs a LAN connection(Wi-Fi) which your both devices are connected. No need to congregate your PC and Android device like USB connection just congregate once and transfer or manage file many time.